Honey Garlic Chicken is an epic 12 minute dinner with a 5 INGREDIENT SAUCE made using pantry staples. Juicy seared chicken breast smothered in the most incredible Honey Garlic Sauce, this is a brilliant back pocket recipe for busy nights! Another addition to my 15 Minute Meals collection! This Honey Garlic Chicken is long overdue. 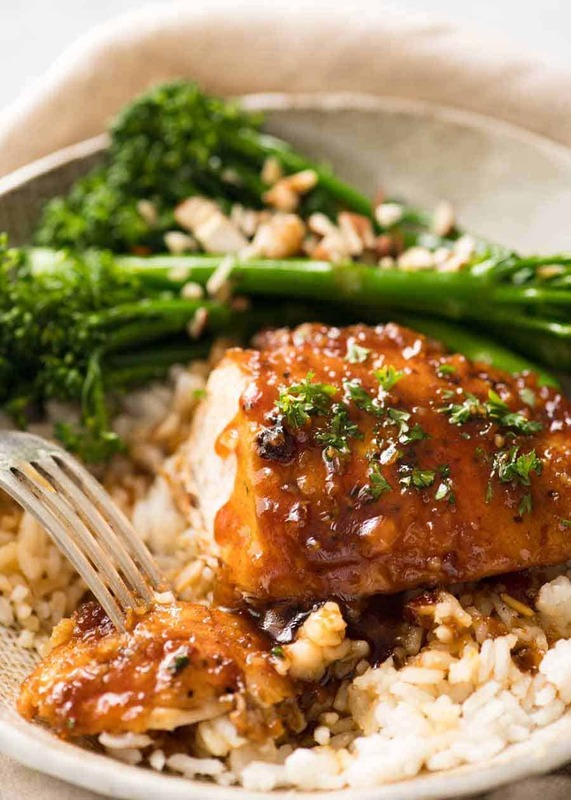 The Sauce in this is a variation of my Honey Garlic Salmon which I first shared way back when I started this website. If I were ever to do a summary of my top 5 Most Used Sauces, Honey Garlic Sauce would probably be right at the top of the list. I love it because it requires so few ingredients that are pantry staples, and when simmered with a seared protein in a skillet so it becomes all bubbly and syrupy…. oh WOW. Sear chicken, add butter, garlic, vinegar, soy sauce, honey. Simmer until the sauce thickens. 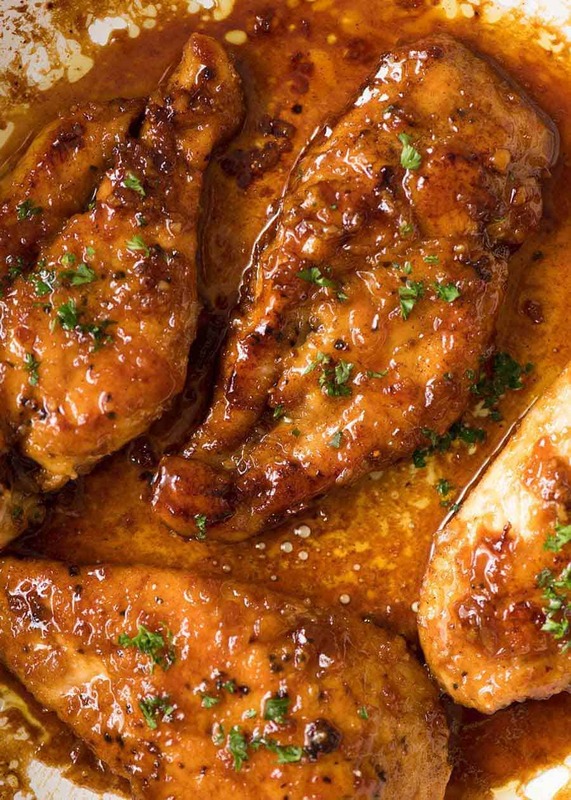 Turn chicken to coat in the amazing honey garlic sauce. And THAT’S IT! It really is that crazy simple. WHY COAT CHICKEN IN FLOUR?? The chicken in this recipe is dusted with flour before searing, and while it is an optional step, I really do encourage you to do this. 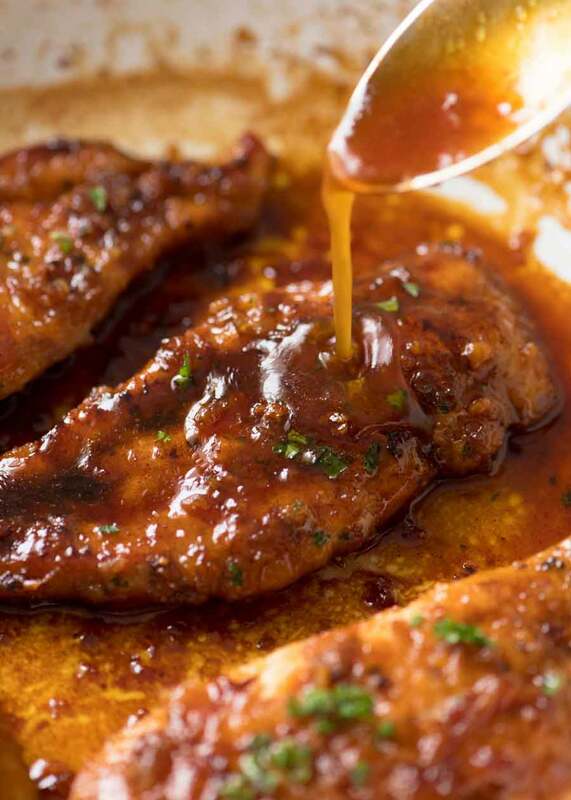 The flour creates a crust that the sauce can cling to, so the chicken is smothered with the sauce. 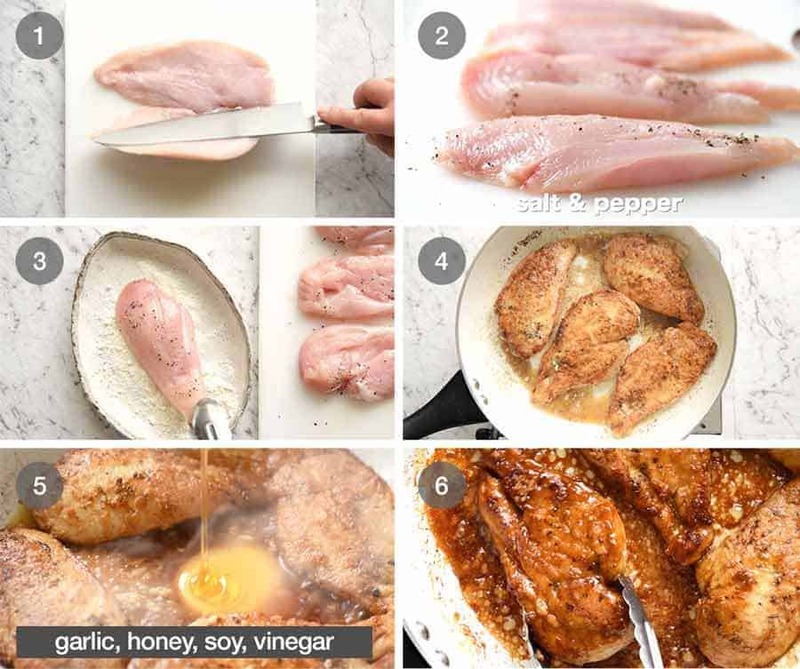 If you just sear plain chicken, the sauce just sort of slips off – which is fine, you can scoop it up with each bite. But it’s even better when the sauce is clinging to the chicken! Recipe video above. 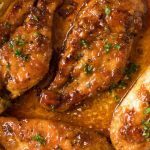 An incredible quick and easy way to serve up chicken breast – seared then simmered in the most amazing honey garlic sauce. 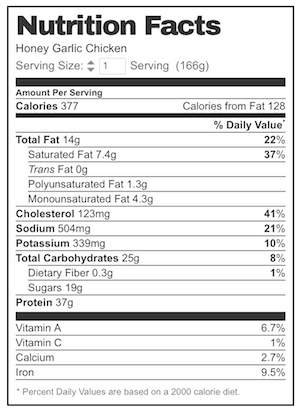 Don’t be deceived by the short ingredient list! It’s absolutely worth the extra step of dusting the chicken with flour because it creates a crust for the sauce to cling to. Cut the breasts in half horizontally to create 4 steaks in total. Sprinkle each side with salt and pepper. 1. Make this gluten free by using cornflour / cornstarch instead. It won’t brown quite as evenly but once covered in sauce, you won’t know the difference. 2. Light or all purpose soy sauce is suitable for this recipe. I don’t recommend using Dark Soy Sauce (flavour will dominate). 3. Nutrition per serving, assuming you scrape every drop of Sauce from the pan, and why wouldn’t you? The fish down at the beach taunt Dozer endlessly, splashing around and leaping out of the water. 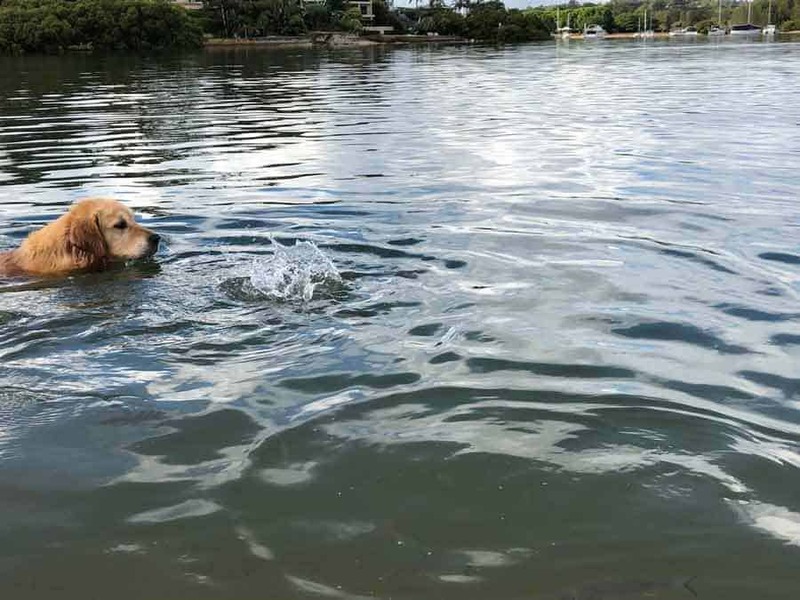 Sometimes he’ll be in the water swimming non stop chasing fish for an hour! It’s brilliant – no effort required on my part. The post Honey Garlic Chicken appeared first on RecipeTin Eats.